Planks are my favorite way to work my core because of how many variations there are! I can easily do a core workout of just planks and not get bored because it’s so easy to mix it up. Plus, I don’t feel same tension I get from doing too many crunch-like moves. 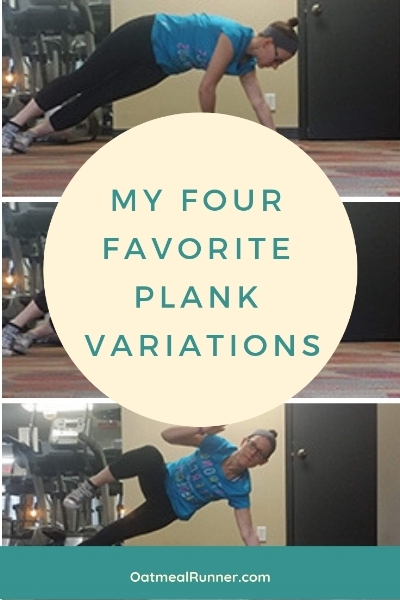 Here’s four of my favorite plank variations that you can use to strengthen your core too! Start in a high plank position so that your hands are right underneath your shoulders. Bend your right arm from the elbow and lowering it on the ground so that you can lean on your right forearm, then do the same with your left arm. Then push your body up with the right arm and then with the left arm to finish on a high plank position again. Try not to rest in one position and be continuously moving from high to low plank. Start in side plank with arm extended directly under shoulder and legs out straight. Wrap top arm underneath body rotating hips down. Open back up to arm facing the sky then repeat for 30-60 seconds. Switch sides and repeat full exercise. Start in a forearm plank position. Lift your hips slightly and shift shoulders backwards. Then shift forward to bring your chest almost to the ground. Push back up and continue moving back and forth for 30-60 seconds. Start in a side plank on your left forearm with your right arm extended overhead. Bring your right knee toward your right elbow in a crunch. Return to start and continue for 30-60 seconds. Repeat on your opposite side.